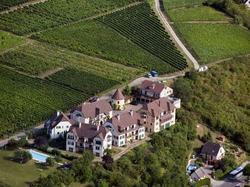 This Residence is located on the Route des Vins d'Alsace. Its suites have an LCD TV, a living area and an equipped kitchen. Free Wi-Fi is available in the entire hotel. The Kanzel Suites Residences also has an heated outdoor swimming pool and a sauna. Guests can relax on the terrace of the floral garden. The Kanzel Suites Residences has an extensive wine cellar, and guest can enjoy a drink on the terrace in summer. A full buffet breakfast is also available in the hotel dining room, which offers a panoramic view. The Kanzel Suites Residences is situated on an Alsatian vineyard, and guests can enjoy hiking and cycling in the surrounding countryside and visit the region. This self-catering suite offers a seating area with a flat-screen TV and a private bathroom with a hairdryer and free toiletries. This suite is located on the ground level and features a minibar, kitchen and bathrobe. This studio features a electric kettle, seating area and minibar. Offering a balcony with vineyard view, this self-catering suite offers a seating area with a flat-screen TV and a private bathroom with a hairdryer and free toiletries. It features a mezzanine.